Can Students Buy In If You’ve Cashed Out? 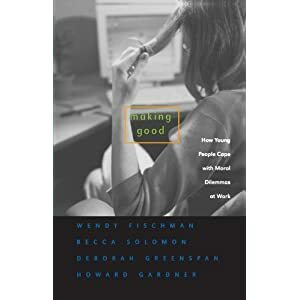 My latest public transit literary conquest is the book Making Good: How Young People Cope With Moral Dilemmas at Work, a fascinating study exploring how training and new professionals in the fields of journalism, genetics, and theater deal with moral gray area in their work. I had no idea that as I dove into the material this morning, I would come to find my own moral dilemma before the day was out. Mostly because I didn’t expect to get that far in the book today. Long MBTA commutes = extended reading time. Thanks, Nemo! We have all been a part of that committee at the office or work project that exasperates us endlessly. Whether it’s a policy that we don’t agree with personally, or an initiative that just isn’t panning out as hoped, it’s difficult to go forth with all our hearts in supporting it. To avoid raising hairs on the arms of current colleagues, I will refer to a previous example to provide clarity. A former place of employment endorsed a pace of programming that was, to understate the issue, breakneck. I worried about the level of stress that it put students under- many were either constantly sick, unable to take advantage of all the options presented, or in a perpetual state of exhaustion- and I voiced my concerns openly about that philosophy of student engagement. But my worries were placed aside, and that pace continues even in my absence. My question from an ethical standpoint is, how do we sell students on a philosophy, a policy, or a program that we’re not sure about ourselves? Is our primary responsibility to uphold the role of advisor, and guide students toward the “right” course of action (even if the right course is not the one being pushed by the institution), or should our loyalties lie with those who employ us, working to help students understand the reasoning behind our decisions and teach them to deal with changing environments and regulations? To offer a concrete example from the scenario listed above: is it my job to help students find ways to manage their time and energy in the system listed above, or to refuse to contribute to the system that wears them down so? I don’t have an answer here yet. And while I have not finished Making Good (if the roads don’t clear, I could feasibly do it tomorrow on the bus with a little concentration and some earplugs), I suspect the answer isn’t in there either. But the way I see it, there are a few possible answers to the question I pose in the title of the blog. Yes, students can buy in if we cash out. There are two ways to look at this. Way A: Think of it as luck transferring from one gambler to another. Perhaps students can be the voice of the changes you wish to see. While we can speak on behalf of the students (and in many cases, it is our job to do so), sometimes their voices are more powerful than ours. Conversely, there is Way B: They win big where you haven’t. Perhaps the problems you’re having, and are assuming students will also have, won’t materialize. It is possible for students to succeed and learn in systems that we might not have chosen to put in place for them. But growth can come from struggle, and just as we’d want them to be able to learn from being uncomfortable, we too should be able to learn when we’re uncomfortable. No, students can’t buy in if we cash out. As we know, students aren’t going to always admit the impact that we have on them. But we have the power to help them buy into an idea that they might not believe in or understand. That said, we have the ability to turn that in the opposite direction, and our negative thoughts could sour their experience. Therefore, our cashing out of the experience could hurt its ability to do well- perhaps more so than the setup of the program/philosophy/policy itself! So what can we do? As I prepare to head back into the fray of my present circumstances, I am reminded of a philosophy for combating negativity that I learned from the Harvard Business Review: (1) understand how you feel on the issue and understand that those feelings are valid; (2) understand the point of view of the other party, and why they feel their stance has value; and (3) find out what the other party likes about that position and try to find the good in it. Use this method to stay in the game as long as you can. In doing this, you’ll be able to find a point of agreement on which to sell students, and who knows? It might make you feel better about the motivation of the “other” side. And if you can’t do this? Maybe it is time to fold (at least from this particular initiative), and leave the remaining players to continue the game. Great post with some thought-provoking ideas my friend. The one thing that still irks me about this discussion (which is one we need to have more often) is the notion of 'selling' students on something. Treating our programming and, by extension, ourselves as 'products' to be 'sold' seems to only skim the surface of a much deeper opportunity for learning and development. While I can certainly understand the need to ensure as many students as possible attend programming (funding and other pressures are real and we have to consider them), selling can emphasize program outcomes (numbers and satisfaction ratings) at the expense of learning outcomes that require deeper investigation and cannot be reduced to the lowest common denominator. Please make sure you write another post once you finish the book. This is great stuff! Thanks Lisa! I always really appreciate your support :)That's the trouble I'm having…I don't like the idea of "selling" anyone on anything either. I agree that the value has to be there from the start. I haven't mastered the art of making that pitch when I don't know if the added value is there, and honestly struggle with if I should make the pitch at all in that instance.There are more posts on this book coming, so get excited! I echo Lisa, and the frustration I have is part of a bigger frustration that "selling students on" is a part of. We sit and develop our desired outcomes and our goals, and our missions, etc, etc. But where are the student goals and desired outcomes? I think of the colleague who is running a week of programming virtually alone because the student involvement has waned. Well,if the students don't want it, why is it continuing? I appreciate the vantage you're talking about when it comes to us cashing out, but what about when the students cash out? There are some hands we might have to play out to the end, but, like poker, sometimes we have to fold and regroup so we can wait until we have a stronger hand.